A new app which teaches users about the history of the Aber Valley has recently been launched at an event in Senghenydd. Walking Through Time is an Aber Valley Heritage Group Project that aims to help people stay fit, whilst teaching them about the history of the Aber Valley. The Aber Valley Heritage Group is a volunteer run charity who previously fundraised and set up the Aber Valley Heritage Museum. They wanted to expand on this and help educate residents and visitors of the history of the landmarks around them. Users can now take part in a 3 mile walk of the Aber Valley using the new bilingual Smartphone App as their guide. 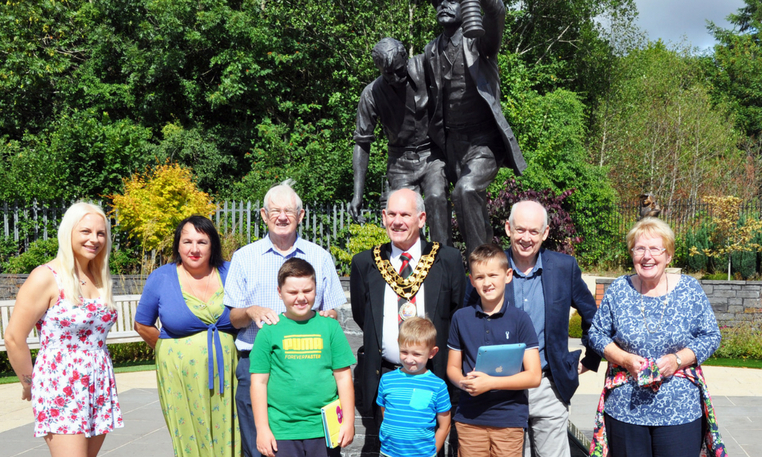 The trail starts at The National Mining Memorial & Garden in Senghenydd and takes in a total of 30 points of interest along the way as users through Senghenydd & Abertridwr. The app allows users to learn about the history of landmarks while travelling the route, as well as viewing old photographs along the way. It has been designed to encourage users of all ages to discover the local heritage whilst exercising their feet & their minds. The project has been a year in development, and has been provided with funding from Caerphilly County Borough Council’s Community Regeneration Fund. Cllr Michael Adams, Mayor of Caerphilly county borough said: “I was delighted to attend the launch of the new Walking Through Time history app, which enables users to explore the fascinating history of local points of interest and landmarks throughout the Aber Valley. The new easy to use app can be accessed by all generations and will really help to educate both residents and visitors to the area about our wonderful local history”.